Ah, summer is here, thank goodness. It’s hot. Customers have gone to the beach or mountains. The phone is not ringing every minute. You can relax, catch your breath after a crazy spring, kick back a little, go home early, recharge the batteries for a busy fall. Sure, you can do all those things. But the customers who shopped in May won’t be back for months, maybe even a year, if they think your store is in the “Gone Fishing” hibernation mode. Summer is – or should be – a selling season. Think of your customers’ lives between Memorial and Labor Day: softball and soccer camps, vacation travel and family reunions, barbequing and backyard living, outdoor home improvement or just enjoying the fun, flowers and peace of their garden, patio or deck. Are they also at your store? Shoppers spend money on discretionary items all through summer, yet not enough garden centers give them much incentive to spend it at their place. Many look to be taking a breather, with forests of out-of-flower nursery stock, tables of leggy perennials and half-empty greenhouses “beckoning” customers to visit. To be fair, some businesses follow a strategy of “Peak the Peaks,” which counts on a massively intense spring, a low-key summer, with a smaller peak in November and December. That’s OK for those who can take risks, but it can leave the rest vulnerable because overheads don’t stop. Bills keep coming, and cash keeps flowing out the door from June through October. Many well-run garden centers use a Countdown Checklist approach to spring (i.e., “13 days to go … Has Pete got his carry outs lined up? … Has the shade-house irrigation been checked yet?,” etc.) Why not hold a post-spring meeting to analyze the previous few weeks to identify winning and losing products, employees, vendors, ideas, programs and so on? Summer is a great chance to entice shoppers to stay, rather than pushing them through as efficiently as possible. In spring garden centers have to help customers spend. By now, most homeowners will have the color and veggie basics; in summer they want to relax, stroll and be inspired to spend. Remember: It’s a different season, so you’ll need a different marketing message. You can change the mindset, and a good place to start doing that is by formulating a summer business plan based on a marketing plan and sales goals. You can entice customers to buy during the summer with effective visual merchandising, such as the way Shorty’s Nursery in Vancouver, Wash., uses this relaxing pathway. What do you want your summer image to be? A fun place to relax so customers can find a gift for the family reunion next week? A store where someone really does know how to freeze those green beans they have grown this year? Somewhere that has fresh basil to replace that just smashed by the hail storm? A local store that supports our community efforts to clean up the lake beaches? A retailer that has a nice, big classroom customers can rent for our neighborhood watch meeting? Why not be the place for food preservation how-to? Garden centers have empty parking, bathrooms, rainproof buildings and salaried staff. Why not offer a place for groups to meet? Communities are always on the lookout for somewhere different to go, especially now that budget cuts are closing municipal buildings. Garden centers can be the local oasis, meeting point, charity event center and more. Now is the time to be honest as buyers or merchandisers and admit that those sure-fire winners were, for various reasons, nothing of the kind. Give them (and all the other leggy, past-prime products) a couple of weeks – no more – at 60 to 70 percent off and call spring over. Note the losses, record your thoughts for your buyer or vendor and move them off the property. Use the leftovers for PR or goodwill; consider giving them to a good cause if they are still in decent shape, or dump them if not. It always surprises me when garden centers don’t seem to use the weed killers that they sell. Get a crew to clean the beds and paths, especially under the tables. Who knows what lurks there by late June? Replant those tired beds of spring annuals with high impact, summer plants and some audacious tropicals such as palms and yuccas. This is especially important to do on the road frontage. Upgrade those demo gardens that have peaked, particularly in the vegetable and fruit departments. There’s nothing worse than peas past their prime! Use the brief time between spring and summer to repair, replace or remove the worn and tired equipment (staff included!). Those things give a bad image to the consumer who nowadays expects all stores are tidy and fresh, 365 days a year. If you did the math correctly when you were setting margins and prices in winter, the more heavily used retail areas such as the greenhouse, shade area and indoor store will by now have paid off their direct expenses and will be past their category’s break-even point. This means you can run short-term volume buys and two-for-one specials on selected items where price makes a difference—such as orchids, big colorful perennials or in-flower hydrangeas. Short term specials also keep customers interested and train them out of that fall blowout sale expectation. There are a lot of products, such as summer furniture, fountains, statuary, arbors and so on that take space to create the shopping impulse. These products are often overlooked in the spring rush when plants are packed all around them. Consumers don’t buy those things every day, and it takes time, space and information to enable customers to relate an item to their own lifestyle. The photo on page 20 shows an effective way to market hammocks. You can’t do this so much in spring, but in summer, this is an impulse sale waiting to be made. Display pottery, container plants and garden decoratives together to suggest end results (plus ready-to-go pots and a potting/installation service for the “Do It for Me” shopper). Group annuals and perennials together with easy, woody shrubs, a trellis, fountains, planting mix and food, in themes that suggest a home garden or patio. Create a scene for outdoor entertaining with small furniture, tropicals or palms in pots. Use fragrance on trellises, table centerpieces, screens of boxwood in pots or troughs, large (3-gallon) ready-to-use herbs. 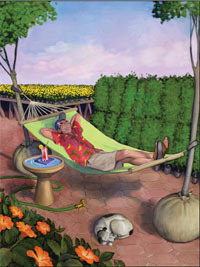 Show how backyard living can reflect escapism, privacy, peace, fragrance, water, play, family, shade, wildlife. In climate zones 3-8, garden centers do not need the same selling space from June to September as they did in April and May. Yet very few make a point of physically reducing their outside sales area or, where possible, their greenhouses and inside store. When you have 30-percent less room, you have 30-percent less temptation to buy product to fill it and 30-percent less labor needed for the inevitable watering, dusting and moving. It also means a shorter, more enjoyable journey for the customer in the summer heat. There is a huge opportunity to be the “How-To Place” when it comes to preserving, cooking or even just enjoying the food people are growing. Become part of the broader community by getting in with the local food and wine set. Bring in restaurateurs for classes, run salsa cook-offs or tomato tasting competitions, best pizza toppings and so on. Not only will it create fun marketing openings and bring in new people, it will also be helpful for the employees who will be selling the veggie plants next year. The vignette can be a very effective way to merchandise products in the summer, when customers are more likely to stroll through the grounds. One area with a lot of summer opportunity is the house-call diagnostic type of service. Go to customers’ homes to analyze, advise and do the work for them if required. There are millions of new lawn and garden customers in the past two years, who by this stage in the year are developing all sorts of “What? How? and When?” questions about all those things we inspired them to buy in the spring rush. Why not now make a business of helping them achieve the success and expectations they had back in April? It might even be a way to win over consumers who shopped at a cheaper place, which is probably not going to offer this kind of service for their customers. Most garden centers have the resources for this (those summer overheads again) and could at least break-even on this service. It’s definitely worth a look! This should be your mantra this year: Summer is a season, not a break. Yes, we’ve given you a lot to chew – things to do, opportunities to take advantage of, challenges and that very scary word, “change.” But the core fact is that a year-round garden center either needs to use its resources to make a summer dollar and maintain a positive market message or close down and go fishing. Good luck explaining that latter choice to your customers, who just might not be your customers when you get back. Sales volumes are traditionally pretty modest in summer when, depending on climate zone, June is half of May, July can be down to 6 percent of the year’s sales, and August can be even less. But unlike spring when people are buying for needs and tasks, summer is all about impulse. Because summer shoppers are not coming in with a “must buy” list, smart retailers will slim their offer, especially in plant material, to what looks visually appealing, thus saving both inventory dollars and labor to maintain it. Displays of good looking stuff, massed in high-impact, shoppable displays on end caps and hot spots will turn “impact” into “impulse” week in, week out. No photo-shoot groupings or catalog front-cover displays are needed, just simple “WOW!” plant combinations suggesting fragrance or a touch of the tropics can be all it takes. Or a simple outdoor living ensemble, like a fire pit, bistro set, a bubbling rock fountain and evergreen shrubs for privacy can turn a casual garden center visit into a $1,000 sale. Summer is definitely a time when a good gift, home-accents and personal products offer can pay the overheads, but not if customers think the place looks like a tired old nursery. Clearing out tired plants might even be financed by departments like this that could do well in summer.